Looking for ways to deliver better customer service? Check out how three men in a loft brought zen to the table. It sounds like the beginning of a joke, really. “Three men walk into a loft …” But it’s actually how the Zendesk story begins – around an old kitchen door-turned-desk in a Copenhagen dwelling, where friends Mikkel Svane, Morten Primdahl and Alexander Aghassipour dreamed of bringing a little zen into the otherwise crazy world of customer support. The result is a leading cloud-based customer service platform specifically designed to drive customer satisfaction, particularly when satisfaction is at its most crucial apex: problem resolution time. And the good news is that because of Redbooth’s collaboration and integration with Zendesk, users can now enjoy all the benefits that this platform has to offer. And the story is only beginning. For years, successful companies like Apple, Google and Philips Electronics have been touting the same message: differentiate yourself based on the experience you deliver to customers; not on the products you sell. Agents can track progress and escalate issues without leaving Zendesk. Every comment on the task that gets created is added to the ticket thread, giving full context on what is happening. Non-customer-facing teams can collaborate solutions to problems, and easily notify the customer-facing team when issues have been resolved. Take speed-to-resolution, for example. It can mean the difference not only between quarterly profits, but whether a company stays in business or not. Customers demand responsive, quick-to-resolve action when problems arise, and they need a smooth hand-off between customer input and back-end internal systems, teams and processes in order to resolve issues. Our partnership with Zendesk helps meet those demands. Because so much more customer interaction takes place online rather than face-to-face, it’s more important than ever to pay attention to the details. Technology entrepreneur Jeff Bezos explained his philosophy when it comes to above-and-beyond service when he said, “We see our customers as invited guests to a party, and we are the hosts. It’s our job every day to make every important aspect of the customer experience a little bit better. Zendesk brings organizations closer to their customers. In fact, with this seamless integration, customer issues are immediately addressed with a single click driving internal collaboration and speedy problem resolution. 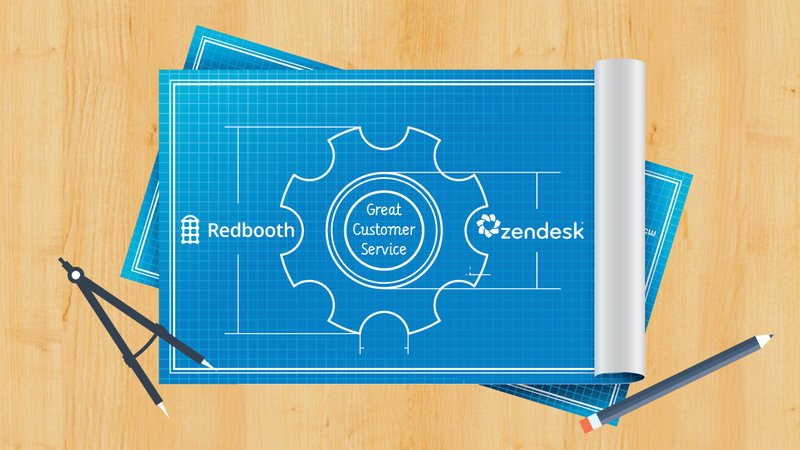 Additionally, Zendesk customers who add this integration get to experience Redbooth benefits and services in the same Zendesk environment, look and feel that they’re used to – dramatically enhancing customer service, efficiency and productivity. As Redbooth CEO Dan Schoenbaum knows, keeping existing customers satisfied is much less costly than obtaining new ones, and this Redbooth partnership enables Zendesk users to drive the highest levels of satisfaction at the most crucial times. “Zendesk handles the communication with the customer; Redbooth manages collaboration internally. Together, this is an extremely powerful integration with real, bottom-line impact,” he said. Zendesk is a customer service platform designed for companies that want to create more meaningful, personal, and productive customer relationships. This integration brings visibility, strength and collaboration into the ticket resolution process, enhancing delivered services and benefitting from customer feedback. If increasing retention and customer lifetime value sounds good to you, take a look at our Integration Guide, and set up your Zendesk integration now. What are you doing to enhance customer service? Do you already use a customer service platform? If you use our Zendesk integration, what do you think? We look forward to reading your responses below, and be sure to include any customer service success stories if you have them!